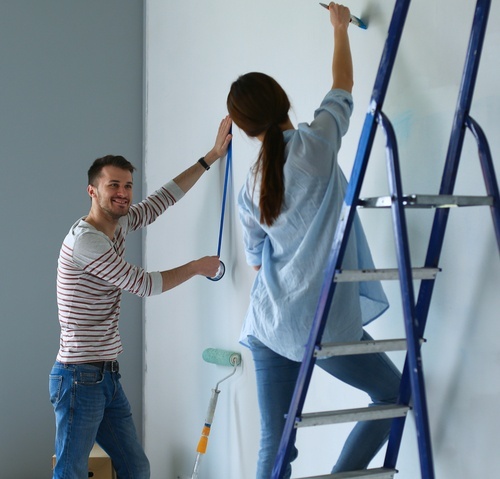 Whether you’re staging your home to sell or updating the look of a home you just purchased, chances are you’ll be painting some walls. While painting seems easy, there are some steps you should take to make sure the finished product is one you’ll be happy with. Follow these tips to get a flawless finish that even a professional would be proud of. One of the best ways to ensure a great paint job is taking the time to thoroughly prep. Start by cleaning all the walls with warm water and a little soap. This is especially important when painting bathroom or kitchen walls, as they can be coated with a layer of grease that may not be immediately obvious. Once you’ve cleaned, move furniture away from the walls and cover with sheets. Place a drop cloth on the floor to catch any paint spills. Remove all outlet and switch covers and any other items that aren’t permanently attached. Patch holes with compound or caulk. After cleaning and prepping, tape the areas you don’t want to paint with painter’s tape. This includes trim, windows, baseboards and molding. The outside edges of the tape should line up with the edge of the wall. If you are going from a dark to a lighter color, it’s always a good idea to put on a coat of primer first. Primer also helps if you’ve repaired damage to the wall or if you’re painting over glossy paint. Pour the primer into a paint tray and roll onto the walls. Let dry. Once the primer is dry, it’s time to prep your finish paint. One gallon of paint covers approximately 400 square feet. If you need more than one gallon of paint, pour them into a 5-gallon bucket and mix them so that you get a consistent color. Always mix your paint thoroughly. Using an angled brush, paint all the edges of the walls, about two inches thick. Use caution and try to work the brush just up to the line of painter’s tape in order to achieve a crisp line. Load the top 1/3 of the brush with paint and tap it against the side of the bucket. Next, pour paint into a painter’s tray and work the paint onto a roller. Begin in a corner and paint in a “W” pattern. Keep the roller loaded with paint. Once you’ve painted an entire wall, roll lightly in the same direction to even out the paint. Let the first coat dry thoroughly and repeat with a second coat of paint. Before the second coat dries, remove the painter’s tape. It is helpful to go over it with a razor to ensure you get a smooth edge. Try not to let the paint dry before you remove the tape, as you may also remove some of the paint with it. Step 8 – Clean Up and Enjoy! Clean up your paint and brushes, remove sheets from the furniture and the drop cloth from the floor. Replace switch and outlet covers, furniture and hanging pictures. Stand back and admire a job well done!